CORRECTING and REPLACING Calvin Klein, Inc. Collaborates with Amazon Fashion to Bring a Digital Experience to Life in New York City’s Flatiron District and on College Campuses across the U.S.
NEW YORK–(BUSINESS WIRE)–Fifth paragraph, third sentence of release should read: A product giveaway of a limited number of the CALVIN KLEIN JEANS “A$AP Rocky Trucker Jacket” will also be conducted through CALVIN KLEIN’s social channels in the U.S. (instead of An in-person product giveaway of a limited number of the CALVIN KLEIN JEANS “A$AP Rocky Trucker Jacket” will take place at 7:00pm ET on Friday at the Flatiron Plaza). CALVIN KLEIN, INC. COLLABORATES WITH AMAZON FASHION TO BRING A DIGITAL EXPERIENCE TO LIFE IN NEW YORK CITY’S FLATIRON DISTRICT AND ON COLLEGE CAMPUSES ACROSS THE U.S.
Calvin Klein, Inc., a wholly owned subsidiary of PVH Corp. [NYSE:PVH], will combine the physical and digital brand experiences through an immersive activation, in collaboration with Amazon Fashion. Following the success of last year’s holiday retail experience, the CALVIN KLEIN x Amazon Fashion NYC Market will be an interactive brand event at the Flatiron Plaza in New York City opening to the public on Friday, October 5th. The three-day event will immerse guests in a physical market with a series of digitally enhanced experiences driving to Amazon.com/mycalvins. The CALVIN KLEIN x Amazon Fashion NYC Market brings to life the CALVIN KLEIN JEANS fall advertising campaign through interactive stalls that integrate product and technology. 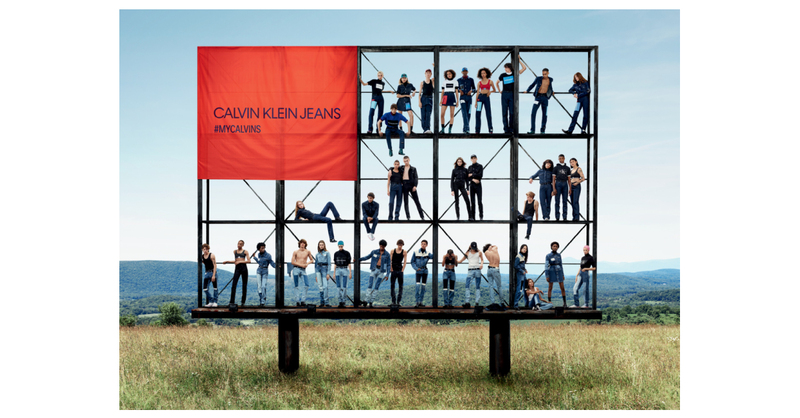 The experience will feature the “Together in Denim Billboard” as seen in the campaign, allowing visitors to recreate the campaign shoot, complete with a photographer to capture photos. Visitors can play games for the opportunity to win prizes, including Amazon devices, CALVIN KLEIN UNDERWEAR, CALVIN KLEIN JEANS products and accessories, and other exclusive merchandise available only at the activation. Limited-edition water boxes, featuring artwork from the latest CALVIN KLEIN JEANS campaign, will be given away through vending machines housed in a larger-than-life water box installation. At the #MYCALVINS Campaign Shop, guests will be able to try on new styles from CALVIN KLEIN JEANS and shop the product via the Amazon App. In the Amazon Alexa Jukebox Lounge, visitors can use a jukebox upgraded with Amazon Alexa to control the music and lighting with their voice and interact with the music on digital screens. At the Popcorn Stall, guests can pose for photo moments in a one-of-a-kind booth with floating popcorn – designed to recreate the special effects of the CALVIN KLEIN 205W39NYC fall runway show. Amazon SmileCodes throughout the space will facilitate a seamless shopping experience to the dedicated CALVIN KLEIN digital store on Amazon Fashion. CALVIN KLEIN brand ambassadors and notable personalities will be visiting the Market throughout the weekend. The CALVIN KLEIN x Amazon Fashion NYC Market is located at the Flatiron Plaza on 23rd Street between Broadway and Fifth Avenue in Manhattan, New York City. It will be open to the public Friday, October 5th from 5:00pm – 10:00pm and Saturday and Sunday, October 6th and 7th, from 11:00am – 9:00pm ET. Admission is free. In celebration of this unique moment, Calvin Klein will, for the first time, bring a limited-edition product drop: the CALVIN KLEIN JEANS “A$AP Rocky Trucker Jacket” exclusively to Amazon Fashion. This jean jacket, created for the artist, will be available for customers to purchase on Amazon Fashion at amazon.com/mycalvins beginning Friday. A product giveaway of a limited number of the CALVIN KLEIN JEANS “A$AP Rocky Trucker Jacket” will also be conducted through CALVIN KLEIN’s social channels in the U.S.
CALVIN KLEIN and Amazon Fashion have collaborated with Prime Student Ambassadors at college campuses across the country, driving the #MYCALVINS movement and introducing #MYCAMPUS, an opportunity for college students to interact with the brand on their home turf. Beginning in August, CALVIN KLEIN-branded Amazon lockers were opened at select colleges and universities across the country advertising the brand's availability on Amazon Fashion. With a history going back over 135 years, PVH has excelled at growing brands and business with rich American heritages, becoming one of the largest apparel companies in the world. We have over 36,000 associates operating in over 40 countries and almost $9 billion in annual revenues. We own the iconic CALVIN KLEIN, TOMMY HILFIGER, Van Heusen, IZOD, ARROW, Speedo*, Warner’s, and Olga brands, as well as the digital-centric True&Co. intimates brand, and market a variety of goods under these and other nationally and internationally known owned and licensed brands.